Hey Chipsters, this post is about one of my current projects, the CSP – CHIP Station Portable. I’m a big fan of the $9 C.H.I.P. – it’s a great module and I still can’t wrap my head around the $9 price tag. I’ve also bought two Pocket CHIPs but I’m frankly not the biggest fan. I’d rather use a single CHIP to build a small system and add the required components whenever they are required – e.g. add a screen via Tzatziffy to build a small picture-frame. Looking at the official pocket chip page gives me the impression that Pocket CHIP was made as a Gameboy replacement, but I’m still not convinced that the keyboard can be used for gaming. It’s too clicky, too hard to push .. simply not the right gadget for me. So the big question: How can I used the super cool CHIP for some gambling around, but have decent buttons and a nice form factor? My first approach was to mill a custom wooden case with a screen and some buttons. But this has been done way too often by the game industry to do it once more. There are Sony, Nintendo, SEGA (only to name a few) who invested probably millions and had professional development teams, designer and usability tester to come up with a nice housing. So re-using an existing housing would make way more sense. There were already Gameboy and GBA thread running in the forum and I didn’t want to steal a project from another chipsters, so I’ve searched on. WOW! Thats an amazing amount of work and cost – the display driver alone cost 2x the money of CHIP and the all in one board is targeted at $80 and probably worth every penny (thats for the modification, you still need a (mostly) working PSP). The work to connect all the flat band cables must have taken weeks! Add batteries reuse of PSP battery? The amp isn’t expensive, same for the SD slot. CHIP has an parallel LCD interface that should more-or-less work with the display, so we only need the DC/DC part (we have to convert 5V to ~23V to drive the back-light, but I gained quite a bit of experience with the Tzatziffy) and we have to find a way to connect to all those nice buttons, battery, screen etc to CHIP. Here we go, CHIP + PSP display, without expensive FPGA board. This was more like a proof of concept, soldered with 20 free wires and an external power supply. The image was crystal clear but slightly shifted to the right (that issue is now fixed by using another driver). I’ve search for a pin extender that would be compatible with CHIPs OS to avoid a custom kernel an found support for the PCA9555, single interrupt 16pin extender and connected this extender with some community help to act as a keyboard. So pushing the keys will make them act as regular keyboard inputs. This helps a lot, especially with emulators without gamepad support. The real work was to get all the connector, the DC/DC circuit, the amp, the SD and C.H.I.P. on a single PCB that can be installed inside the PSP. I’ve asked othermod if I could get the outline, but unfortunately he replied that he isn’t ready to share his work – which I totally understand! I’ve screwed the PSP to my CNC and measured all position by simply directing the drill to the center and write down the position from the screen. I’ve also cut a preliminary rough layout to see if the connector would end up in the right position. The board is automatically identified by CHIPs OS and the driver for display, SD and the fake keyboard are loaded. The display runs of the onboard battery as well as CHIP does. SD card and Speaker .. all running fine. The CSP is almost solder-free but only almost. The battery has to be connected to the board and I didn’t spend the time to find the right (probably SONY internal) battery connector, instead I’ve simply soldered two wires to the battery. The same applies to the speaker and the 5V charging cable. But it’s super easy to strip the cable and connect them to the board. Reboot CHIP and it will recognize the display, SD slot and the buttons (as keyboard input). I’ve added a script which is in big parts copied from https://raw.githubusercontent.com/fordsfords/blink/gh-pages/blink.sh to the respository. 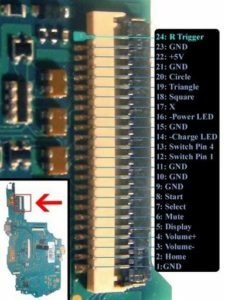 If you feel like modifying the Chip Station Portable – DIP you might need some info about which pins are already used and which are still available. I’ve tried to make this as user friendly as possible, but after all this is a hardware hack. The PSP was never meant to carry a C.H.I.P. and some minor modification are required. It is complicated to remove the insulation of the speaker wire, I’d recommend to cut the connector to get to the part of the wire that has already been stripped. The battery isn’t quite compatible or mine is bad .. the charge indicator is always “loading” and never reaches “fully charged”. Are you interested? I’ll probably build another CSPs on the weekend and can make some documentation for the hack. Just leave me a comment. I’m also thinking about selling the kit, but need to know how many would be interested. Target price might be ($35-ish) for the board with all connectors (you still need your own PSP) but really dramatically depends on the demand. Step 1, remove everything from your PSP, remove every screw and every electronic board until you’ve a PSP as shown below. Step 5, modify the frame a little bit .. Step 6, connect the ZIF cable, align the PCB and crew the frame in. Make sure the d-pad is clicked into the frame. Hay! If you need to re-home your PocketCHIP’s I would love to have 2 more. I use mine to play Multiplayer Descent. 4 Players is the max number supported and I have 2 PocketCHIP’s so 2 more would suit me right down to the ground. The $20 increse in price killed my ambition to buy 2 more right away – but I still think I’m gonna get them some day. I wan’t to have that portable LAN party rig and ready to travel. This is an awesome project, though I had a somewhat easier, though less compact solution with the pocketchip: buy a $25 bluetooth gamepad on amazon, that has all the same button layout as the vita. Wow! Again an amazing work! I’m becoming your fan, dude! I’m interested in it! In fact I bought my CHIP during the kikstarter time impulsively. Don’t planned any use with it. I would be more interested in tzatziffy 111? for a cheap screen. Definitely interested, but which model PSP would that be for? It’s for the PSP-1000 since it’s the only model that has a compatible display. As far as I know, making the thumbstick work (which would be absolutely awesome, I agree!) does require additional hardware, since it needs an analog input which, afaik, the chip doesn’t have. But I think it would fit on the current board and wouldn’t add too much to the costs, so maybe Kolja can look into it? you’re right, psp-1000, analog joystick not used. Honestly: Its unlikely that I’ll work on it as I don’t like the joystick and it would be a lot modification required … one would need an external adc and some driver interface and I highly doubt that there is support for an analog joystick via adc in common emulators. Sry. Count me in for a board! It’s absolutely awesome! I’d possibly pay $25 plus some bananas for this board! Absolutely in for this! I have a PSP lying around – would love to upcycle that to Chip! What’s your ETA on having some boards (CSP) ready for sale – I’ll probably grab 2 – do you need some bananas for upfront investment? Put me down for two please. Hello, I’m interested in buying this as well! I will post updates as soon as I have all parts available, which will take a while. I’ve ordered the parts for the first board at mouser and their prices are just too high for a production run.